Frequently asked questions about the benchmarks for secondary schools. The secondary benchmarks were reviewed and revised in 2014 to ensure they remain relevant and useful. They will continue to be regularly reviewed and updated. The secondary benchmarks are research-based and aligned to other education initiatives, and the review process followed the same robust consultation processes we used in the development of the entire suite of benchmarks. They contain a full reference list and bibliography. Do the benchmarks replace the Career Education and Guidance in New Zealand Schools guidelines? The benchmarks bridge the gap between the National Administration Guidelines (NAGs) and Career Education and Guidance in New Zealand Schools (the guidelines) – they do not replace either of these. The guidelines were developed as a handbook to help schools plan and implement their career development programmes and services. Why are the student outcomes different from the ones listed in Career Education and Guidance in New Zealand Schools guidelines? 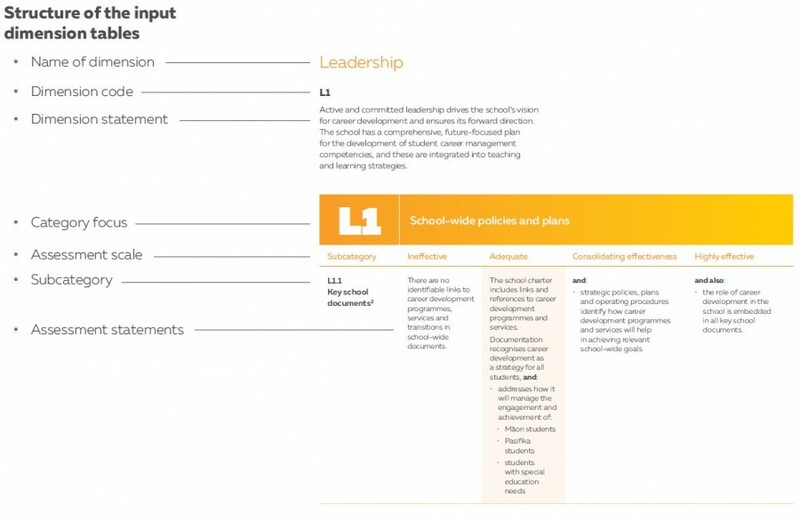 The student career management competencies focus on the competencies students need to develop to enable them to transition successfully from school. In contrast, the guidelines detail by year level what students should be developing. The guidelines were also developed in 2009, before the benchmarks were created. Some of the benchmarks contain more than one requirement at each assessment level. It is possible you will not meet all the requirements. You should start at the adequate level and ensure you meet these requirements as a minimum.